I can sum up Halloween this year in one word: wet. Unfortunately, due to high water, downed tree limbs and safety precautions, the Tour has been canceled. Major bummer, but not really a surprise given the fact that it had been raining hard for a few hours by that point and we’d already navigated flooded streets. We had been planning on meeting up with our friends Mark (love his name) and Kara at a bar and grill called EastBurn in Portland anyway, so we decided to head over there earlier. Found out they were having a Halloween party and there was a $5 cover charge plus a bar menu only, but we did not let this get in the way of our fun. 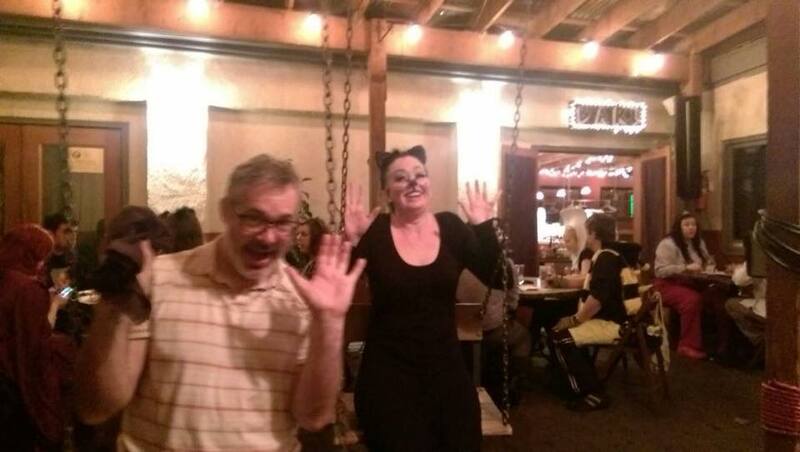 Sadly Tara, Mark, and I were the only ones in the place not wearing costumes, but Kara was dressed as a cat so she represented for us all. EastBurn was really cool. There are multiple levels and they’ve got this great covered patio with heat lamps, bamboo, fire, and swings suspended from the ceiling at a few of the tables. We grabbed one of these prime spots and got down to the business at hand, said business being drinking and eating (and people-watching). I switched it up this time and opted for gin, because – let’s face it – vodka and soda gets boring. Also had a pork loin sandwich and sweet potato fries. Good stuff. Afterwards we headed to Mark and Kara’s house to play Scene It, missing out on the actual “party” part at EastBurn, but that was okay. They just bought their house a few months ago and this was my first time there. Cute little place and, hello – it’s in Portland. ‘Nuff said. The game was fun, even though I got trounced. When it comes to pop culture, music is more my speed than movies, which explains why the only question I got right was the one that asked for the name of the fictional rock band in Almost Famous. Did I mention the swings at EastBurn? So even though our plans changed, we still had a pretty good Halloween (which I am now calling H-allwet-een). Got home well past midnight, but thanks to DST coming to an end it really wasn’t too bad. Maybe next year we’ll have an opportunity to do the cemetery tour. At the very least, if we do go out I’ll make sure to be more prepared. Friday we had a costume contest and potluck at work. 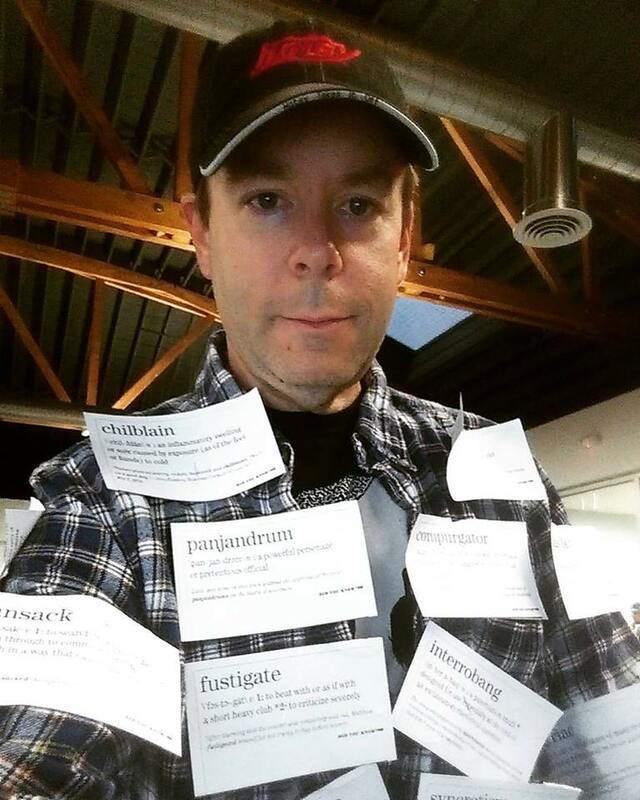 I did not think I was going to be able to put together a costume in time, but ended up recycling pages from a “Word of the Day” calendar and came as a dictionary. It doesn’t get much more homemade than this, folks. Surprisingly, the costume was a hit and I was actually in the running for the grand prize but lost out to Fred Flintstone. My white chicken chili was also a hit. I do love a good potluck, but talk about a random assortment of food. It’s not often you end up with a hush puppy, a turkey meatball, a Thai salad roll, guacamole, Harvest Cheddar Sun Chips® and a handful of baby carrots sharing the same plate space. And yet, this odd combination somehow works. Bummer, Mark. Sorry you’re tour got canceled. But I’m glad you’re all safe! Hope the flooding doesn’t cause much damage. We used to get flooding from the river every spring in my hometown, and the downtown businesses always suffered a lot of damage to their buildings. No fun! 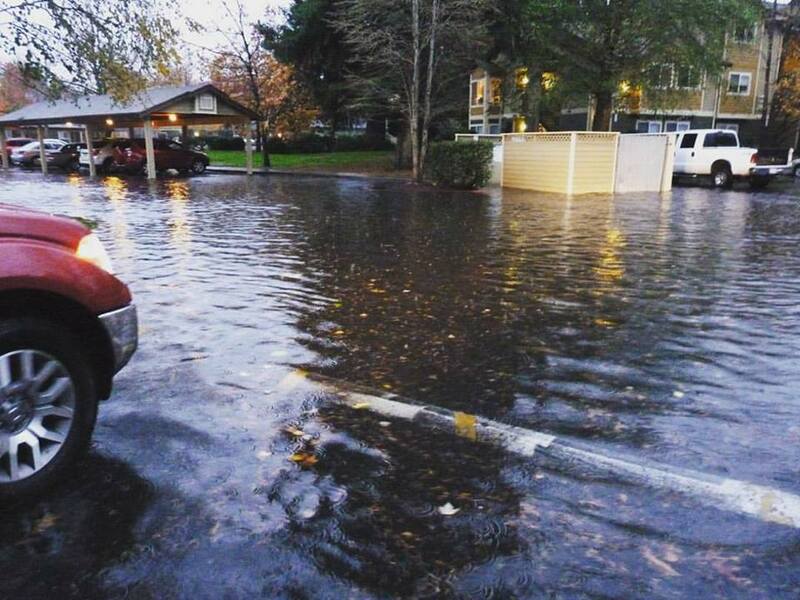 The flooding was mostly the result of clogged storm drains and has since dissipated. This won’t be a problem in a few weeks, once all the leaves are gone from the trees. I hope my post made up for your tour fail. That’s a shame! Sound like you still had fun. I made white chicken chili for dinner tonight! Ha! It did. I was actually thinking, “At least Bijoux got to see a cemetery!” when I read that. Hope your white chicken chili also earned rave reviews! Your costume would have put you in the running at my work as well. Nice job. Good to know! I’ll have to swing by your work next Halloween and snag that prize.